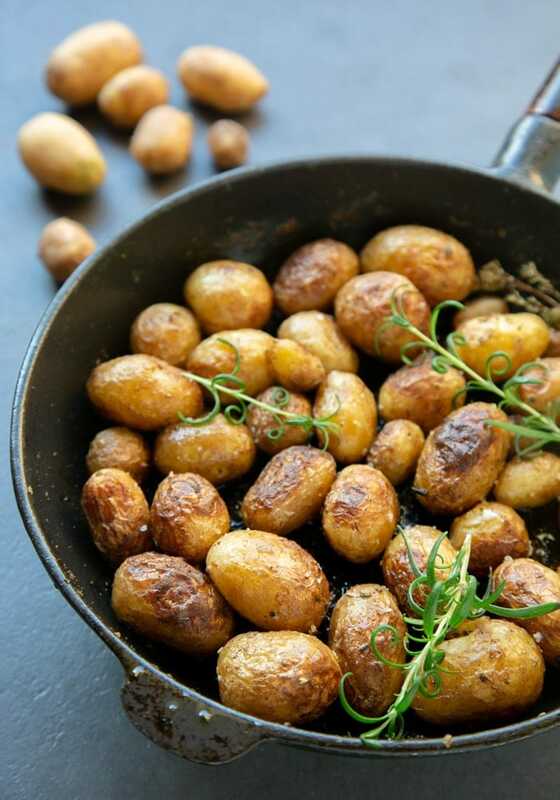 These crispy Italian pan-roasted new potatoes are sure to become one of your favourite dishes. They’re rich and loaded with seasonal Italian flavours and no butter required. Pair them with grilled chicken and a big salad and you’ve got yourself a nutritious, balanced and awesome meal ready in a blink. And it also happens to be gluten-free and dairy-free! 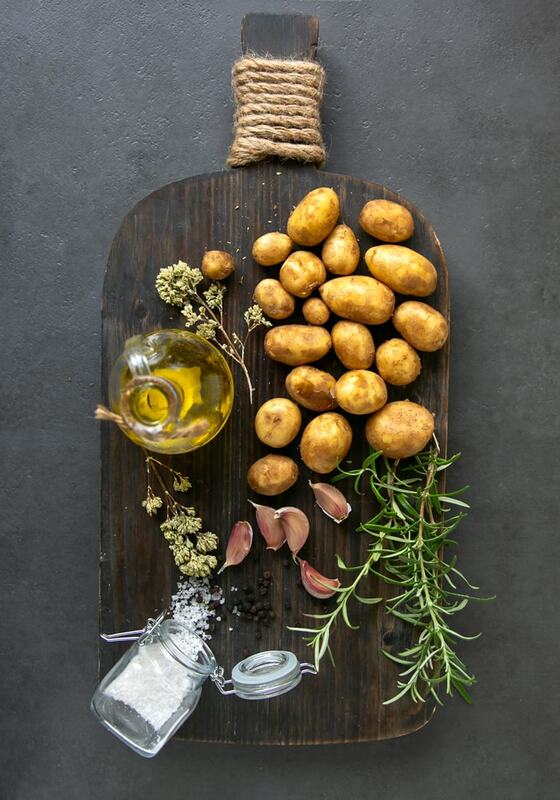 As a proud Italian, I’m totally addicted to roasted Italian new potatoes —without a doubt one of the most popular Italian recipes, loaded with classic flavours such as rosemary, oregano, garlic, and extra-virgin olive oil. This traditional dish has always been a family favourite. Growing up, my mum would often make these pan-roasted potatoes served alongside grilled fish or chicken. My mum loves to keep things simple, so following her path, I like to season my roasted potatoes just with a glug of high-quality extra-virgin olive oil, garlic, fresh rosemary and freshly dried Sicilian oregano (any other oregano is OK too, but the very best is sold in branches). 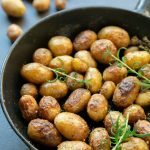 Why Italian New Potatoes are so good for you? 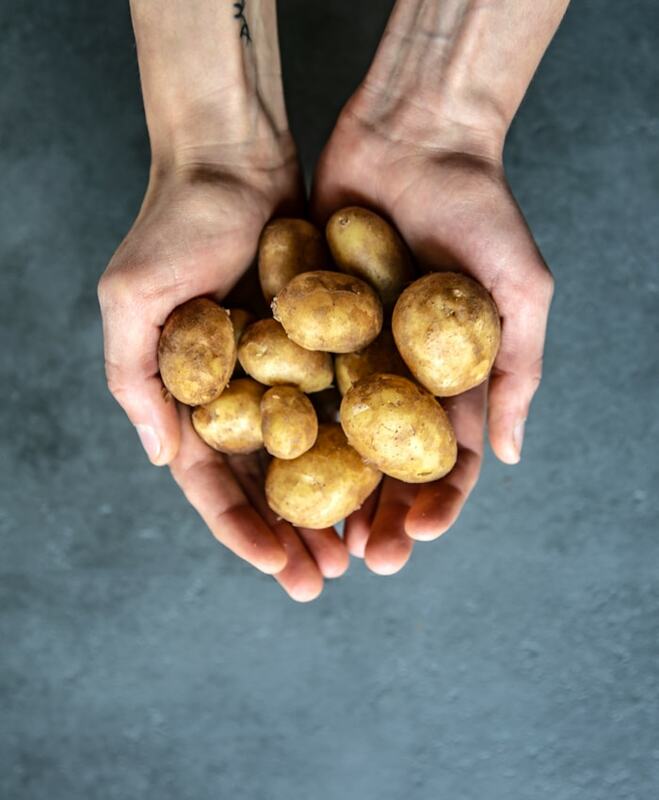 Italian new potatoes have a unique delicate flavour and a rich smooth texture, they come with a very thin skin and do not need to be peeled (which means less work in the kitchen and more nutrients – YAY!). They’re also highly nutritious, and a very good source of carbs, vitamin B6 and potassium among others. 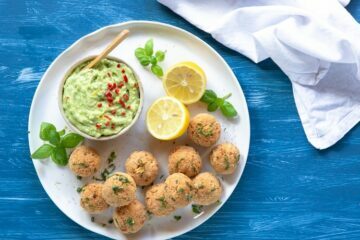 If that wasn’t enough, Italian new potatoes are conveniently cheap, filling and can be paired with virtually anything – from other veggies, to any kind of meat, fish and poultry. When are Italian New Potatoes in Season? The warm Italian weather in late summer is the perfect time for planting new potatoes, while here in the UK we’re busy harvesting and eating ours. Italian new potatoes are picked up in October, so the best time to enjoy them is from late October until December. 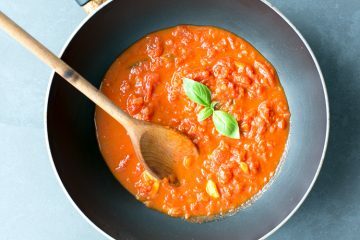 Over this period, they become the highlight of traditional Italian cuisine and are served with pretty much any kind of secondi (main courses). I’m so glad to have partnered up with Branston and Seasonal Spuds for this amazing recipe. Branston’s Italian New potatoes are hands-down the best you can find in UK, and grow along a 10 mile strip of coastline in the Puglia region, situated in the south of Italy. They’re still harvested the traditional way, gently gathered by hand to preserve their delicate skin. The result is a perfect little spud with an incredibly soft texture and an awesome light flavour that pairs well with anything. Branston’s Italian new potatoes will be available in Tesco stores throughout November and early December. 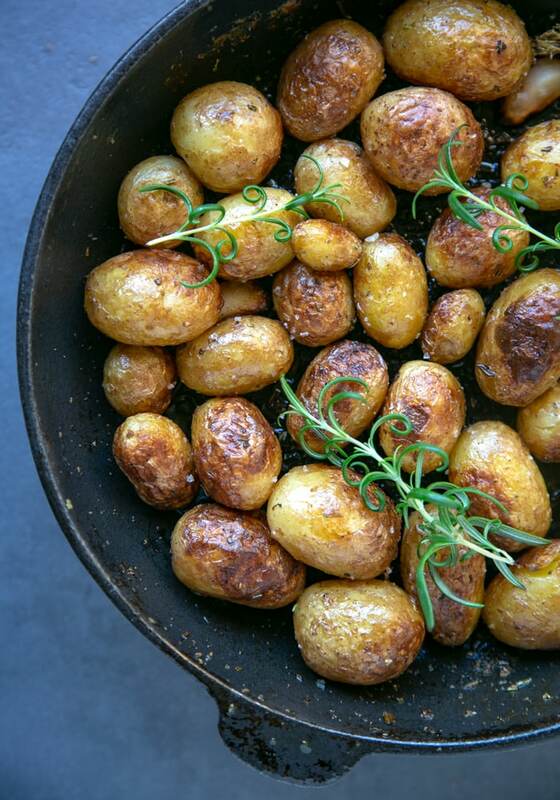 Pan-roasting potatoes instead of baking them is a total game-changer. It means you can get crispy, delicious potatoes with no need to turn the oven on and wait at least 40-50 minutes for them to be ready. Roasted potatoes are awesome and will always be, but sometimes there’s just not enough time. This pan-roasted version is just equally delicious and ready in a fraction of the time – A total win-win if you ask me! The secret to achieve perfectly crisp pan-roasted new potatoes is to cook them twice. First you give them a quick boil to soften them up, then you pan roast them until crispy perfection. It doesn’t take much effort and it’s most definitely worth the extra step. Make sure you choose roughly same-sized potatoes, so that they cook at the same time. Half-way through add the seasoned chicken breasts, and let it all cook until perfectly done. I mean, prepping dinner doesn’t get easier than this! This recipe is definitely a keeper if you’re not quite ready to give up summer-ish food in lieu of comforting stews and baked pasta meals, gives. 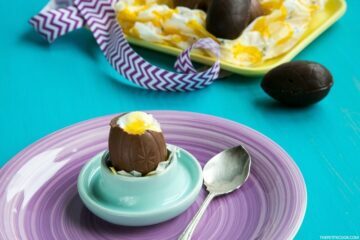 Plus it’s super easy to make, highly nutritious and guaranteed to be loved by grown ups and kids alike. These crispy pan-roasted new potatoes are super versatile and go easily with pretty much anything. I’ve decided to serve mine with grilled chicken breast this time, but any kind of meat, fish or veggies would work just as great. Clean the potatoes by gently rubbing them under fresh running water. Bring a large pot to a boil, then fold the potatoes in and cook for 5 minutes. Drain the potatoes and transfer into a large bowl. Add in 3 tablespoons of extra-virgin olive oil, rosemary, oregano, sea salt and black pepper to taste, and stir to combine all the ingredients. Heat 1 tablespoon of olive oil in a large skillet over medium heat. Fold the garlic and the seasoned potatoes in and cook, stirring occasionally, for 2-3 minutes. Brush the chicken breasts with the remaining 1 tablespoon of olive oil, and season with salt and black pepper to taste. Push the potatoes around the edges, place the chicken breasts in the middle. Sear the chicken breasts for 2 minutes on each side, then cover with a lid and cook for a further 5 minutes, or until the chicken is tender and cooked through. Remove the chicken from the pan and cut into thick slices. 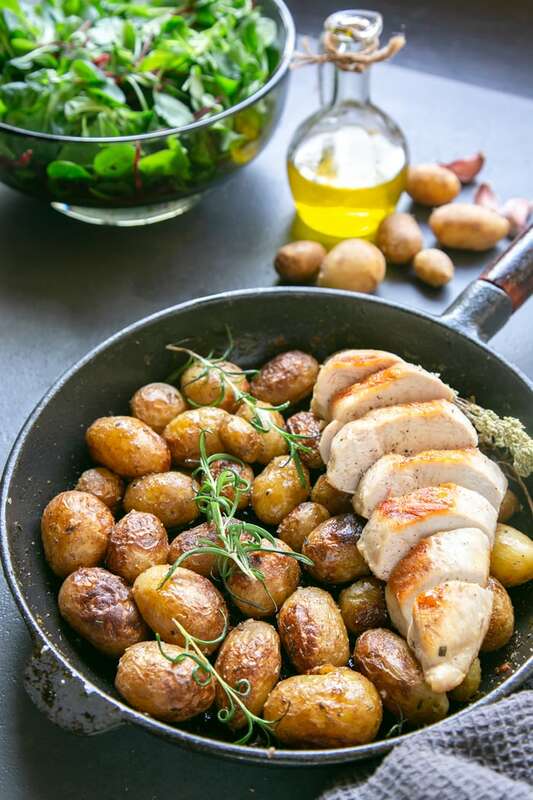 Divide the pan-roasted Italian new potatoes among plates, and serve with the grilled chicken breast and a green salad. 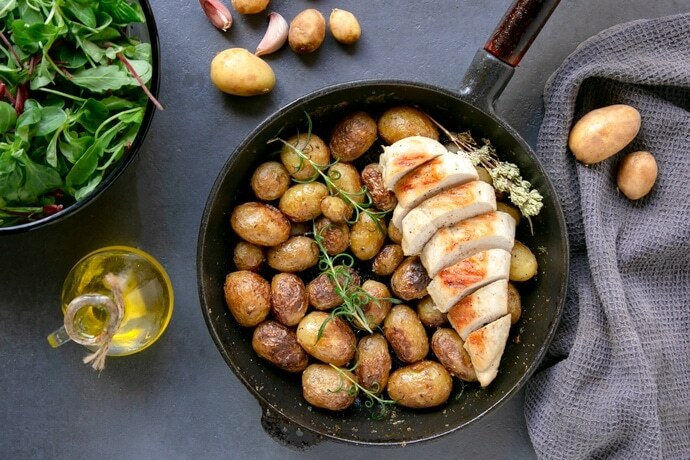 Yum, these potatoes with chicken look amazing! I am loving the flavour combo in this dish! Pinning to make sometime in the next week! This is a perfect, simple and flavorful recipe! I love the ease of this recipe! Your potatoes look mouthwatering!!! Yum! These potatoes came out perfectly! Interesting to hear about the different planting & harvest times, too. Your photos are so beautiful and so is this meal! Your potatoes look perfect! What an easy and delicious dinner for the family. I absolutely love the herbs and spices. Potatoes look super delicious. I’m putting this recipe on my next week family menu. My boys will love this, I’m sure. Thank you! I look forward to hearing what your boys think of this super easy meal! Such a simple and flavorful recipe! I love the ease of this recipe! Your potatoes look mouthwatering!!! I’ll be making this soon! Wow the color on those potatoes is gorgeous!! What a wonderful idea to pan fry them! I must get my hands on new potatoes! This recipe looks delicious! My family has grown potatoes for decades called Jersey potatoes, which looks just like these little new potatoes. I have some seed I saved from last year to plant in the spring and can’t wait to try this recipe when I harvest next September! I happen to think that the “simple meals” are some of the most delicious. This recipe proves my point. What a great dinner any night of the week. The whole family will love this one. New potatoes dishes always hit in my family, and your recipe is perfect. Bookmarking it. This looks delicious AND simple. Now that’s my kind of dinner! We’ll definitely have to give this a try in the coming weeks. There’s something about new potatoes that always draws me in. Maybe it’s because they’re just so darn cute! I am loving the flavour combos in this dish! And that chicken looks so juicy and tender. My husband will love this! I really like new potatoes too. I like the ‘bite’ they have and the possibilities are endless. Looking forward to this recipe, thanks! Totally agree, simple dinners are the best! Beautiful, beautiful little potatoes! They are so creamy inside, and so crispy outside, i can see that from the photo! I love potatoes and this looks so good. Love roasting baby new potatoes like this. Perfect side for Thanksgiving. Mmmm. Another carb I adore, potatoes! These look absolutely melt in your mouth delicious with the roasting and spices. Thanks for sharing. 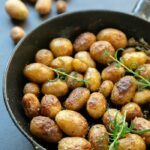 I love skillet potatoes or any potatoes for that matter… and these potatoes look wonderful and tasty! My carb loving family would love this! Pinning for Thanksgiving day! Mmm. These potatoes look so tasty! I love new potatoes but don’t eat them as much as I should! 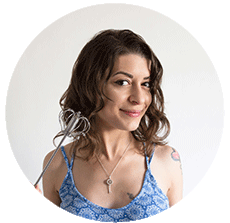 But with that said, I can’t wait to make your recipe! Andrea, this looks absolutely amazing. My boyfriend is mad about potatoes. Thank you for sharing this.